Set up in 2014 by Jo Davey, Absolute Nutrition has won numerous awards for its high-quality range of paleo, high-protein and high-energy treats and snacks. Based in Rathcoole, Co Dublin, the company employs eight staff and is on target to hit revenues of more than €800,000 this year. “It was my love of wholefoods as well as my experience as a holistic nutritionist and busy mum that gave me the idea to create healthy snacks for both myself and our four children,” explains Joan. “While we have a range of products, our best-selling snack is our Original Protein Balls – which won gold at the Blas Na hEireann awards. “Packed with protein and minerals and using ingredients such as coconut, almond, cocoa, dates, whey (dairy, soya) and honey, they are the perfect bite for people ‘on the go’ or as a post-workout snack. Our next popular is our Chia Energy Bombs. Rawlo is our guilt-free pleasure. Made from a mix of dates and pure almond butter, these are blended to create a smooth caramel and then wrapped in 70pc dark Belgian chocolate,” she adds. Her customers are varied and include a mix of millennials, athletes, vegans, ‘free from’ and gluten-free consumers, busy professionals, parents with small children and generally those who live life on the go. Such has been the response to her products that they are now stocked in over 220 shops nationwide, including Supervalu, Fresh and Avoca. With an announcement due shortly, this number is due to double by the end of the year. Jo Davey grew up in the small village of Brittas in the Dublin Mountains, not far from Blessington. She attributes her love for healthy food to watching her mother grow vegetables and fruit on the family’s one-acre garden. “When I was growing up, our mum grew anything she could, from apples and plums to lettuce and broad beans. We had our own hens and got fresh eggs every morning – something that gave me an appreciation of real food and where it comes from,” insists Jo. After school, Jo did social studies before securing a job as a personal assistant to a consultant psychiatrist in the HSE, where she worked for the next 14 years. Married and with four young children, she became more interested than ever in finding healthy and nutritious foods that she could give to her children as treats. “I have always loved cooking and creating recipes of my own and with four young children I began to play around with ‘raw’ snacks. “I was particularly interested in snacks and treats made from nuts and seeds that were sweetened using only honey or dried fruit. While it’s pretty easy to make energy balls that are good for you, the challenge is to make ones that also tastes nice,” explains Jo. She continued experimenting in her kitchen, often until late at night, until she finally came up with her current range. At the time her husband James, whom she met while in secondary school, was spending a lot of time away from home because of his job as a highly-skilled crane hire driver. Working two jobs to make ends meet, the pair hardly saw each other. They decided to emigrate, at least for a while, in search of a better life. Jo handed in her notice and the pair rented out their home and moved into her parents’ house while waiting for their visa to come through. However time dragged on and to keep herself fit, Jo joined Darren Dillon’s Kickstarter Gym in Tallaght. Hearing about her interest in healthy snacks, he invited Jo to supply her snacks for sale to his members. “Within four weeks I was supplying not only Darren’s gym but four other gyms as well. I put up a Facebook page and before long everyone from mums in the school to the local forecourt garages were placing orders. “That’s when I thought to myself… wouldn’t it be crazy if someday I was able to sell my snacks and treats in a supermarket,” explains Jo. Because she had no business experience and needed help in developing her products for the retail sector, she reached out to her Local Enterprise Office in South Dublin which matched her with an experienced mentor whose advice proved helpful. 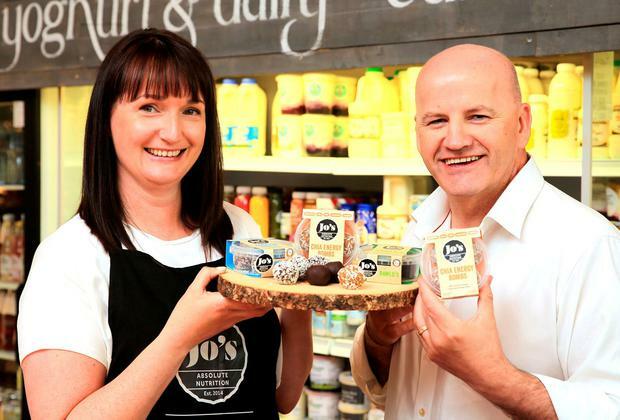 She then joined the Food Academy Programme, an initiative run by SuperValu, Bord Bia and the Local Enterprise Office Network to help nurtures small businesses through their journey from start up to getting their products on our shelves. The plans to immigrate were abandoned. “We hit the market at the right time just as health and fitness was becoming big,” Jo recalls. “But as the business took off, it brought with it a new set of challenges including managing cash flow and managing production capacity in order to meet the growing number of orders. “Before long, I found myself and a team of four staff working in a small catering container at the back of our house. “While not the most suitable it got us past the first year and half until we were able to build our own custom-designed gluten-free British Retail Consortium (BRC) grade bakery here in Rathcoole,” says Jo. James then decided to give up his crane driving work and now works full time in the business. Jo now plans to continue to scale the business, adding new lines to her current range and opening new accounts in Ireland and then overseas. Her new online store is also due to open this year. “I really want to help inspire other people and especially other women, to start their own business. You have to be prepared to work full out, often 24/7, seven days a week but you get out what you put in. “To maintain the effort however, you have to love what you do. And thankfully I do,” adds Jo. Loving what you do is one of the most important steps behind achieving success. Passion helps you sustain your effort during challenging times, while also being valuable in enrolling the support of customers and staff alike. Absolute Nutrition’s Jo Davey has built a thriving business based on her passion for nutritious snacks. Do as much product development as you can in the beginning and be happy with your product and packaging before you go to market. That way you will have greater belief and conviction about what you are selling. Find a gap and fill it. But don’t do what everyone else is doing. Try to be slightly different or innovative. That way it will be easier for you to stand out from your competitors. Have a good network around you. If you don’t have one, like I didn’t, then contact your Local Enterprise Office, go to food markets and events, join women in business groups and forums, etc. Put yourself out there, get to know people and let them get to know you. You can’t grow a successful business on your own.